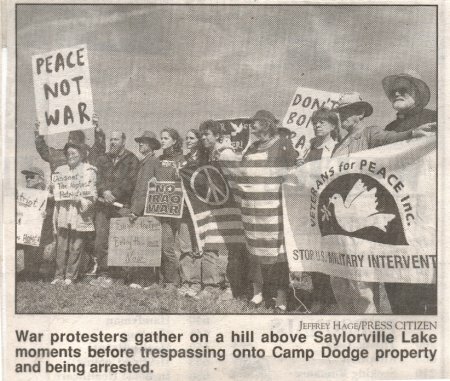 On Saturday, March 22, 2003, approximately 50 anti-war protestors gathers at the Iowa National Guard Headquarters, Hq STARC, in Johnston, IA. They delivered the attached statement asking all of our brothers and sisters in the Iowa National Guard, who are participating in this war against the people of Iraq, to stop fighting and return home! The protestors felt a legal and moral responsibility to raise a clear and strong voice of warning that this war is criminal and immoral. They planned to occupy the facility until these soldiers returned home. 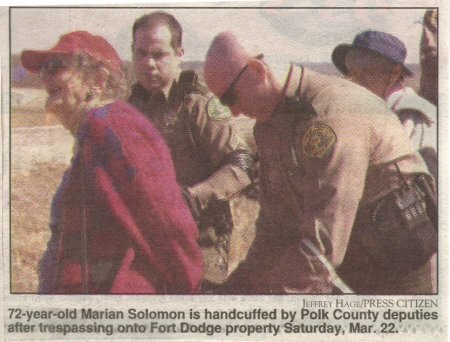 However, the sixteen line-crossers were arrested by county authorities and taken to the Polk County jail. They were all charged with criminal trespass. Fifteen were released on their promise to return for a court hearing. One woman chose to spend the night in jail so that she could appear in court Sunday morning. She pled guilty and was released with time served. Most of the others will appear in court on March 31, others at a later date. Some plan to pled guilty and one will pled no contest. Others plan to pled not guilty and will be represented at trial by Sally Frank, a professor at Drake University law school and National Lawyers Guild. Below a list of those who got arrested.